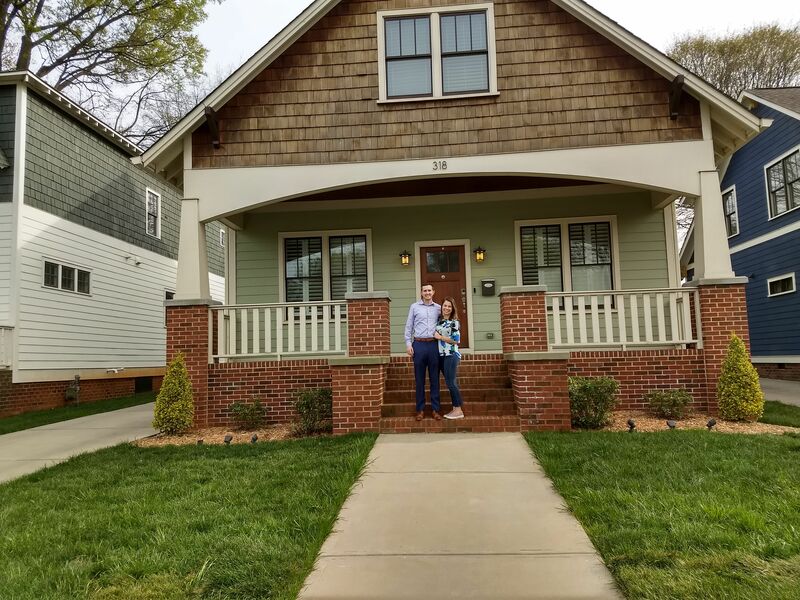 Travis and Victoria Bell moved into the Biddleville neighborhood back in August 2017. Back then they did not know that they were moving into a neighborhood that made it a top priority to create a sense of community. When looking for a house, for the Bells, the appeal of West End homes was their proximity to Uptown and that the style of homes offered were not starter home designs. West End offered homes that people could grow into over time. When moving in, the Bells were pleasantly surprised to find the neighborhood had a strong sense of community. ”I really love the community feel that we have here. I had no idea I was getting that when I moved here. I think some of our friends that have just started to buy houses too have moved into other areas and they don’t really interact with their neighbors or have a community vibe, but we do. Our neighbors are very involved,“ said Victoria. This community vibe stood out to Travis too. He enjoys living in a place where he can go for an evening walk and have a conversation with half a dozen different people. Before moving into the neighborhood the Bells felt some apprehension about moving to the West End, but within a week it faded away. The neighborly welcome they received made them feel comfortable quickly. Victoria explained, “Everybody says ‘Hi.’ Everybody is super friendly. There is a ‘front porch culture’ here, which is really cool. People are sitting on their front porches and when we are walking by they make conversation.” Travis added, “Just walking through the neighborhood. There are people smiling and people waving. There is almost an instantaneous feeling of belonging.” Beyond the waving and small talk, some neighbors even opened their doors to the newcomers and invited them over for dinner when they first moved into the neighborhood. Getting to know their neighbors is something the Bells enjoy. With such a diverse neighborhood, finding points of commonality help to continue to build a sense of community. “We have a diverse set of neighbors and it actually makes our neighborhood a lot more fun. It is even to the point our friends notice it when they come to visit and we talk to them about it,” said Victoria. In Biddleville, the Bells observed diversity in age, race, sexual orientation, education, socioeconomic status, and time of residency. The key to finding points of commonality is getting involved in the neighborhood by joining the board and attending community organized events. The board and the community events bring a wide range of people with different backgrounds together to work on the common goal of enhancing the neighborhood. The Bells not only joined the board, but they also join in at community events like the annual Chilli Cook-Off and an upcoming neighborhood dinner. Victoria explained, “Everybody in the neighborhood is invited to those things. All of those different neighborhood events are key. I am excited to see more of those from our neighborhood going forward.” Community events like these are helping the residents mingle. It is helping to build up that sense of community that is so important to the West End.